Meadows Edge – what came out of the meeting with Tesco? In early January, Transition Belper and Pauline Latham MP organised a meeting with a limited number of invitees and Tesco representatives. These notes are from the Transition in Belper newsletter. 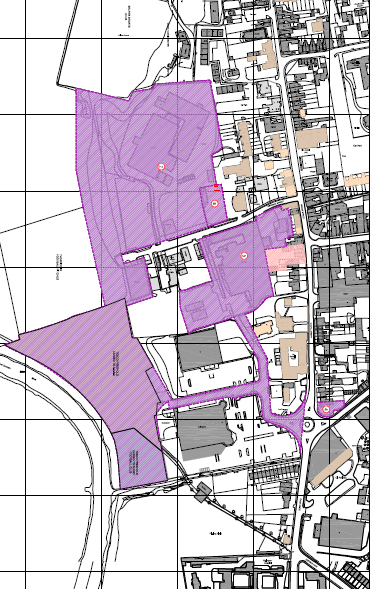 Main factory site, cleared this year following fire – Initial idea is to sell to a developer for housing and a care home. Talks have started with AVBC regarding care home. ‘Castle’ building and Thornton’s factory still standing – Initial idea is to sell to a developer for a mixed use, food and non-food development. House on corner of Roundabout – Not aware of specific plans, no obvious reason not to sell. Firestone House plus parking – Not aware of any initial plans. Land, flood plain, between Morrison’s and River is leased to Rugby Club – no reason to change. Land, flood plain, end of Derwent Street to River (inc. skate park) is leased to AVBC – no reason to change. Slenderella sees a potential opportunity to use part of the site for manufacturing. They are looking for a 30-40,000 ft2 site for manufacturing & distribution and if they have the location and space a significant factory shop and a Brettles museum. a smaller manufacturing site is being sought and felt it would be better to use the site creating work for residents of Belper rather than adding to the dormitory status of Belper. Concerns were raised about the idea of housing and care home surrounding the existing properties not owned by Tesco, including Drop Inn. Part of the Drop Inn success is its location away from housing. Also the chance to use the site to offer positive activities for young people using the centre (such as manufacturing, with apprenticeships and jobs). To help improve the offering to young people could an indoor ‘extreme sports’ facility be developed between the existing Drop Inn facility and the skate park? One of the key ideas from the SPD (Supplementary Planning Document) was the significant opportunity to develop a leisure centre facility that would link with the existing Football, Cricket, Tennis, Hockey and Rugby clubs. This should include better vehicular access, rather than current access via triangle. Since SPD the idea of smaller leisure centre has been raised in town centre but now on hold. Potentially a great opportunity if funding available. The location of this land is special for the world heritage town of Belper. With the river as a potential ‘seafront’ and the original green views on the opposite side of the river this is a one off opportunity to create an exceptional development fitting for its location. Significant discussion took place about a local Masterplan needed to satisfy the SPD for the area between the A6 and the River Derwent, and more importantly a fuller town Masterplan or Neighbourhood Plan that took into account all elements of Belper to be a more sustainable and resilient town. Several funding/resource opportunities to develop a Neighbourhood Plan were discussed, including Tesco helping to fund a locally produced plan using local skills and knowledge. A further meeting will be organised with a wider invited audience to be held at Belper School, Friday 14 March. Belper residents and occasional visitors will have noticed the many physical improvements to key buildings in the town centre in recent years. This is no accident! Much is owed to the grant support from the HLF’s Townscape Heritage Initiative. Come and hear Barry Joyce, former leading planner at Derbyshire County Council, as he charts the success of the scheme in the town. This event takes place at Strutts, Derby Road, Belper, DE56 1UU, on Thursday 3 April, starting 7.30pm. All meetings of the Civic Forum are open to everyone – please note that this one is combined with our short AGM. The subject of neighbourhood planning for Belper is very topical again, and we’re pleased to announce that Mike Ratcliffe, who has been leading on Wirksworth’s plan, has agreed to speak on that town’s experiences of the process. This meeting is for anyone who is interested in the future of Belper, it’s physical development and the facilities and services it needs. If you’d like to hear more, please join us at Strutts’, Derby Road, Belper, DE56 1UU on Tuesday 25 February, starting at 7.30pm. Belper Civic Forum has been active over the last few years consulting with local residents and organisations, in order to put forward positive proposals for the Meadows Edge site, centred on Derwent Street, Belper. The links here are to our two leaflets ‘Belper at the Crossroads’ and ‘Belper at the Crossroads – Our Vision’. You are very welcome to use these documents in discussions on the Meadows Edge area, but please do credit Belper Civic Forum. At the end of November 2013 the Civic Forum hosted an impromptu meetingwith Network Rail’s consultants Alan Baxter and Associates at which their engineers gave a presentation on plans for electrification of the Midland Mainline between London St Pancras and Leeds (via Derby and Belper). · Electrification has been approved by parliament and is due to be completed by 2019. · English Heritage has already carried out consultation on the likely effects on historic structures along the route – of which there are many in the Belper area (described as the most intact stretch of George Stephenson engineered main railway line in Britain) http://www.english-heritage.org.uk/caring/listing/listed-buildings/consultation-process/midland-main-line-designation-consultation/ In 2014 phase 2 consultation will begin on non-railway structures. · Installation of overhead wires and gantries might be achieved in a relatively unobtrusive way, but the height profile of new trains will also conflict with the current overbridges and there are severe limitations on how far the existing track bed can be lowered in the Belper area (the railway has to cross the Derwent either side of the town, as well as the Coppice Brook). A track lowering of 350mm would be needed to avoid changes to the 11 overbridges. · The parapets of the existing overbridges will need to be profiled and partially raised for safety reasons (to prevent people standing on them). · Further details will emerge of the possible costings in 2014, and a landscape assessment (vegetation should be cut back 6 metres from the lineside) following this. · Planning applications are likely to be submitted where necessary in 2015, with work completed within the World Heritage Site by 2017. Network Rail/ Baxter Associates have offered to return to Belper with a further presentation in 2014. Belper Civic Forum is currently experiencing difficulties with its hotmail account, Belpercivicforum@hotmail.co.uk. This means that we are at present unable to send out and receive any messages via this site. If you have tried contacting us recently thorough this, please accept our apologies. Please direct messages to our temporary site – belpercivicforum@outlook.com. Amber Valley Borough Council have announced plans to finally demolish and replace the crumbling, un-listed, Swiss Tea rooms in Belper River Garden. This application was passed by Borough councillors on 18 November 2013, and work will now presumably begin early in 2014. This has been a long-running saga for many people in the town, including the Civic Forum, who were behind a major public consultation exercise on alternative (or rebuilding of the existing) buildings on the site three years ago. We remain concerned at the way the decision was taken by the Council to select the original design by architects McNeil, Beechey, O’Neil, which seemed at odds with public sentiment (at the time very attached to a similar design to the existing building). Since then there have been significant changes to the design, which appear to have satisfied English Heritage and the World Heritage Site authorities, and do look a great improvement on initial designs – the characteristic ‘T’ shape of the building’s footprint is to be retained, together with its outline shape and steeply hipped roof. The World Heritage Site seems to still have reservations about the inclusion of first floor balconies, both on grunds of looks and practical maintenance, but these objections have been over-ridden by the Council. Note – At the start of 2013 the Civic Forum, together with Belper Historical Society, made a last ditch attempt to get a heritage impact assessment of the building, which was refused by the Council, although they did make available a consultant architects’ report (Gleeds, 2009). This report made the case that the building had fallen into such disrepair that conservation of its existing structure would result in a copy of the existing building, rather than preservation. Have you ever wanted to know more about Belper’s unusally large network of urban footpaths, known locally as ‘channels’?. Some of them go back hundreds of years, are the source of local legend, and are a living part of the fabric of our community. Come and hear how Brian Deer and John Morrissey have been getting on at this meeting for Civic Forum members at Strutt’s Community Centre, Derby Road, Wednesday 20 November, 7.30pm (non-members welcome to join on the door – don’t forget, if you join now you get free membership to the end of 2014). We’re sorry to announce that this year’s study visit to the Somerset town of Frome, which was planned for Saturday 28 September, has now been postponed. We had chosen the town as it has an innovative approach to town planning, and this is especially relevant as we start to plan how Belper can start it’s own Neighbourhood Plan process. Please get in touch with us at belpercivicforum@hotmail.co.uk if you are interested in finding out more, and if you would like to come with us on this trip next year.